Cherries are a relatively new addition to our U-pick selection and we are excited to continue to grow our selection and availability. Our cherry field is trained with short trees so ladders are never needed. The season usually starts in mid-June and runs till mid-July. We have more than 15 different varieties available. They include favorites such as Bing, Rainier, Lapins and Van. As well as new selections for you to try like Christilina, Sandra Rose, Regina and many others. -The sweetest cherries should be dark red to almost black in color, not bright red. Rainier is the exception, they will be red with a yellow blush when ripe. -Not all of the cherries on a tree will be ripe at one time, they tend to ripen from the outside in and with more sun exposure. 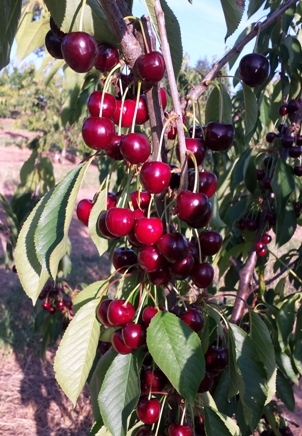 - Do not pick partially ripened cherries (bright red), they will not continue to ripen and will not become sweet.